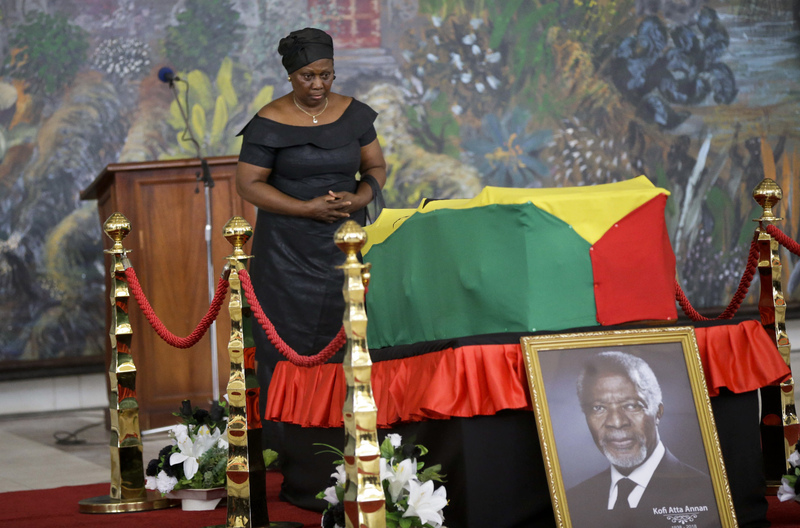 ACCRA, GHANA - A steady stream of mourners paid their respects Tuesday to former U.N. Secretary-General Kofi Annan, as his body lay in state in the capital of his native Ghana. The diplomat’s body was flown back from his home in Switzerland on Monday ahead of a state funeral and private burial in Accra on Thursday. Nobel peace laureate Annan, who was the world body’s first leader from sub-Saharan Africa, died age 80 on August 18 after a short illness. His coffin, draped in Ghana’s red, green and gold flag, was guarded by senior military officers in ceremonial uniform at the Accra International Conference Centre. A choir sang hymns and traditional dances were performed as the public got their chance to say farewell to one of the country’s most famous sons. Fritz Kitcher, who spent his career working for the United Nations in Geneva in human rights, said he saw Annan rise through the ranks. His role as the U.N.’s first black African leader was “an honor for Ghana,” he said. “It was marvellous in our eyes, it was one of these things that we can only dream … he lifted Africa and showed that we are also able to do great things,” Kitcher said. Most of those who queued to pay their respects wore black and red mourning clothes and passed under large posters of Annan to the sound of pulsating drums. Pensioner Joyce Atiase said she was mourning the loss of a “great man.” “We all loved him. 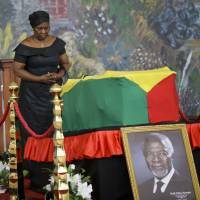 He played a major role for our country, he did his best,” she said.